Massive corporations are known to launch charitable initiatives (they are tax write offs, after all), and Samsung has decided to start an interesting one of their own. This past Tuesday, May 20th, Samsung made their own charitable gesture by opening the first internet school in Kenya that runs entirely on solar energy. 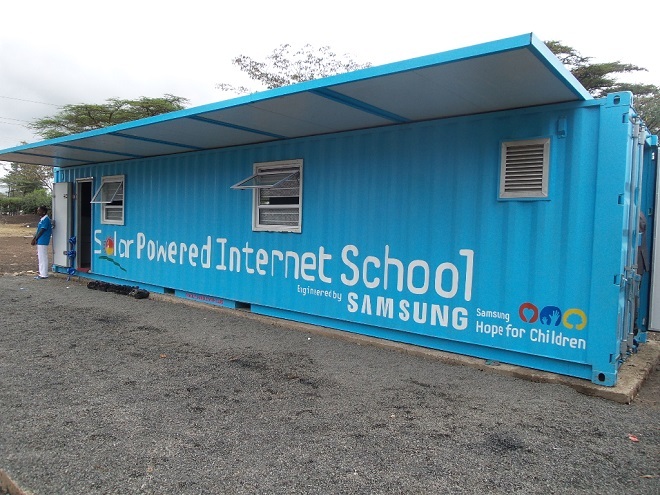 Called the Hope for Children Initiative, Samsung contributed a Solar Powered Internet School, or, SPIS, to the Arap Moi Primary School in Kenya. What is an SPIS? It is basically a massive technological hub that is retrofitted inside a shipping container. It makes transportation of the school much easier. The metal of the shipping container is durable and provides decent enough insulation for the equipment inside, which is fairly substantial. Lining the innards of the SPIS are 24 laptops, an all-purpose printer, a 50-inch electronic board server, internet access, and, perhaps the neatest feature: solar panels. What’s interesting about these panels is that they are constructed out of rubber as opposed to glass, for greater durability. All of the products inside are, of course, manufactured by Samsung and have been optimized to work with the Solar technology. Internet service is being provided to the SPIS with compliments of Safaricom, for five years. In areas with access to electricity, Samsung also provides “Smart Schools”, which come with Galaxy tablets, internet, and e-board servers. What do you think of Samsung’s charitable contribution? Do you hope that other companies will follow suit?